All-Girl Troops join the Boy Scouts of America and wont allow Boys to join them. / [NEWS] All-Girl Troops join the Boy Scouts of America and wont allow Boys to join them. News All-Girl Troops join the Boy Scouts of America and wont allow Boys to join them. The first all-girl troops have joined the Boy Scouts of America, multiple news outlets reported this week. In central Arkansas, the all-girl Troop 19 presented its charter Tuesday, reported local ABC affiliate KATV. Meanwhile, in central Alabama, Troop 219 in Helena and Troop 86 in Vulcan were established, according to CBS 42. Officials told KATV that the program remains single gender, meaning that the all-girl troops will exclude boys. In October of 2017, the organization, now called Scouts BSA, announced it would be accepting applications by girls’ troops for the first time in its 100-year-plus history. The decision was controversial – traditionalists and conservatives accused the group of pandering to politically correct orthodoxy. Others lamented broader societal factors. Appearing on Fox News shortly after the Boy Scouts made their announcement, Wall Street Journal writer William McGurn blamed the “war on boys and masculinity” for forcing the group to allow girls. Many progressives, such as the National Organization for Women, cheered news of the new Boy Scouts’ policy. “NOW welcomes the news that the Boy Scouts of America have once again admitted to their long history of discrimination, this time against girls, and are taking steps to correct it,” the group said in a 2017 statement. Some on the left, however, were skeptical of the organization’s motives. In a piece for Business Insider last May, writer and former Girl Scout Kate Taylor called the “male-centric” decision a “pseudo-progressive ploy” by Scouts BSA and urged women to support the Girl Scouts instead. “The BSA’s history of backwards politics makes the recent changes feel like a cheap ploy to boost membership and win progressive brownie points,” she added. The Boy Scouts of America’s program for older youth this month changed its name to Scouts BSA to reflect the decision to include girls. The Cub Scouts program for younger children opened up to girls last year. Thousands of girls have already joined under an early adopter program. Other Boy Scouts programs for older youth — such as an outdoor adventure program called Venturing — were already open to girls. But those programs didn’t allow girls to attain the highest rank of Eagle Scout, which they now can. An All-Girl BoyScout Troop that boys arent allowed to join. Sure... that makes perfect sense. RE: All-Girl Troops join the Boy Scouts of America and wont allow Boys to join them. These are girl scouts. There's already a place for them. Wonder if the Girl Scouts will be cool with all boy, girls not allowed troops. 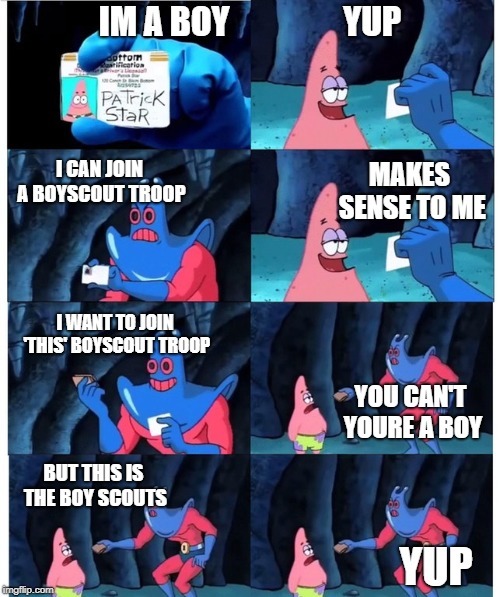 We could just merge the Boys Scouts and Girl Scouts into one big organization. I'm sure that's what the Boy Scouts wanted (for obvious reasons) but the Girl Scouts probably said no thanks (also for obvious reasons). Now we have Girl Scouts, Boy Scouts for Boys and Boy Scouts for Girls. Meanwhile, both parent orgs struggle to stay afloat financially and continue to be pawns in the gender politics wars. (02-11-2019 09:20 AM)49RFootballNow Wrote: We could just merge the Boys Scouts and Girl Scouts into one big organization. I'm sure that's what the Boy Scouts wanted (for obvious reasons) but the Girl Scouts probably said no thanks (also for obvious reasons). Now we have Girl Scouts, Boy Scouts for Boys and Boy Scouts for Girls. Meanwhile, both parent orgs struggle to stay afloat financially and continue to be pawns in the gender politics wars. Not to mention all the other smaller ones like Royal Rangers, American Heritage Girls, Campfire USA which used to be Camp Fire Girls... but made a Boys division and then renamed itself back in the 80s. Interestingly... Camp Fire Girls predated the Girl Scouts as a Scouting organization for Girls, but never reached the same level of success.